I realize I didn’t update as I said I would. Charlotte’s most recent scans are unchanged. She is still considered No Active Disease. Her trip to NYC was quick, 24 hours type of quick. Things at home have been a bit hectic and I have gotten on here multiple times to finish this post and share it. Something always comes up or malfunctions and I am distracted. Tonight I am doing this! She got home after her last scans and quickly began to digress. 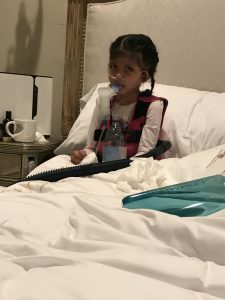 Her coughing fits lasted longer, her breathing more labored, her oxygen dropping constantly. The pulmonologist here gave us a couple of things to try. While they occasionally seemed to help, Charlotte wasn’t doing any better. She began losing weight. In 3 weeks, she lost 3 pounds. Charlotte didn’t have 3 pounds to lose. From November, she has lost 7 pounds. Apparently just breathing is burning calories. Her breathing is so labored from her stomach, chest, and throat, it’s disturbing. After chronic low oxygen, such a weight loss, and minimal eating the doctor has decided to put Charlotte on oxygen 24/7. She is also on a high dose of steroids every day and a very low dose of antibiotics 3 days a week. The steroids seem to be helping her. Her coughing doesn’t happen in the middle of the night now. Her appetite comes often. Right now her go to meals are Greek yogurt (10g of protein!) and Mac n cheese that I fatten up with ghee and whole milk. *updated: her appetite has leveled off and now she wants bacon and strawberries. Another tough thing is missing school. The pulmonologist requested we keep her home with how bad the flu is right now. Charlottes school is AMAZING! They have all been so helpful in many ways. 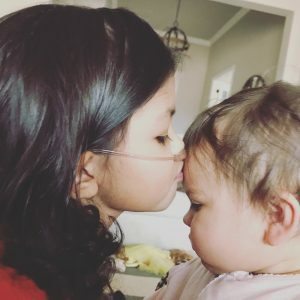 I am updated on how many kids are out sick so we can figure out if Charlotte may be able to go. Her teacher has also made multiple trips to our house to drop off school work, milkshakes, and brought a bag for her to decorate for valentines. The mothers at her school have put together a meal train and have dropped off delicious meals. When I was first approached with this, I kept declining. I felt as if there were other families that could use it more than us. It has always been so hard for me to ask for or accept help. Luckily, this one mom was persistent and wouldn’t take no for an answer. Even when I didn’t know, God KNEW. He knew things would get hard. He knew Charlotte would need more care, He knew Tyler would be traveling more, He knew I would be exhausted. He knew we needed these families to help us! We are beyond grateful! Charlotte was able to return to school for the first time in over a month! Sweet girl was nervous and full of anxious feelings. While she wanted to see her teacher and friends, she was so afraid to start coughing. Her coughing isn’t your typical cough. It is scary to see and hear. She gets many looks and concerned people. I think she sometimes feels embarrassed. As I carried her into school, it was playtime. Her classmates were running around outside and once they saw her they came running up, calling her name. The smile on her face, literally melted my heart. It’s been a long time since we have seen that smile. We walked into the school and as I spoke with her teacher and school nurse, Charlotte grabbed her backpack from me and asked if she could put it in her class. That right there, was HUGE!! Any type of activity may cause Charlotte to cough and so she refrains from almost anything. She usually would’ve asked me to carry her and the bag. It brought tears to my eyes. Tears of joy. A couple of her friends came in and asked if they could go see Charlotte. When I went to say goodbye, they were coloring together. More tears were shed that day, then the first day of school. It was such an amazing feeling to see her happy and excited about something! She did well. She had a couple of struggles but nothing significant. We are currently trying to get Charlotte to the Children’s hospital in Philadelphia. They are number 1 in pediatric pulmonology and because they are one of the top pediatric cancer hospitals, their doctor has seen more cancer kids with lung damage. The pulmonologist has researched and has said this happens in less than 1% of children, and if we can get to Philadelphia, please go! Insurance can never be easy. As of now we are trying to go through all of the hoops to get her there. 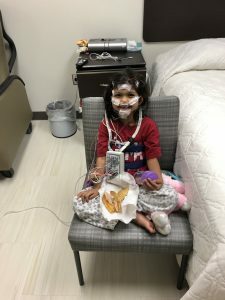 Charlotte also had a sleep study done. Good news came back that she does not have sleep apnea!! Reading through Hebrews, this was a clear reminder and if you have the chance, read through chapter 11, the faith of these people is amazing. May God heal that sweet little girl. My prayer is with the family too. May God Bless Charlotte and your family and may His Holiness, Grace, and Love melt her disease away! I love Hebrews 11, and how you referred to it in the midst of this suffering. Faith is the assurance of things hoped for, the conviction of things not seen. I’m praying for Charlotte and your whole family. Still praying for Charlotte. For you. For the doctors. God is faithful. God is merciful. God is love. Woke up, burdened to pray for sweet Charlotte! …for her mom & dad. Thanks for your God glorifying faith! Continued prayers for little Charlotte. Thankful our Lord Jesus has His hands on her. Thankful for her school with so much love. Thank you for the update. You are all amazing . I have always loved the York family. First meeting them in 1974 at a small church in Bend. Watching the family grow and teaching many of the children and working closely with Charlotte ‘s grandmother Julia for years. Working with Julia for years. She always was such a blessing to everyone. Our Lord knows our paths . Praise God for the healing for sweet Charlotte. I am honored to know the York family. A Wonderful family and blessings to many. I lift you all up to the Lord. I know little Charlotte doesn’t know me; but please tell her I love her and she is dear to me as her family is. Love , blessings and prayers for you little Charlotte! Prayers for Charlotte and your family. I’m so happy she was able to go back to school and see her friends. Little steps and keeping faith, you are doing an amazing job supporting her. God is amazing through Charlotte. A beautiful child in a loving family. Keep fighting and praying. Praise God Almighty! How sweet it is to know your trust is in Him and Charlotte is in His hands. Thanks for sharing so we can continue to pray for her needs. 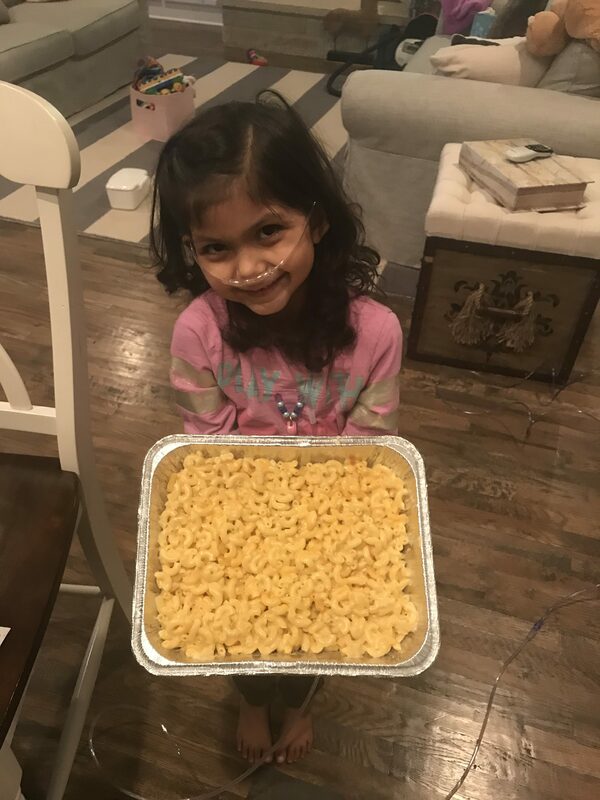 I’m praing along with you, Jacqueline, the faith of Hebrews 11, as you continue to trust God for Charlotte’s miracle and for every struggle and need she and your family face each day. And Thank you for shining His light so steadfastly and so brightly not only in your victories, your triumphs and joys but also in your disappointments, your sorrows and fears. You are always covered in prayer dear one. Praying for little Charlotte and for all the prayer needs. Lord fall on her with a cloud of your presence and healing. Strengthen all her family and support system. Amen!!! Still sending prayers for you all. God is good and I pray for Him to give you all peace strength and comfort. You are an amazing woman and mother. I also pray for strength and rest for you. Continued prayers for Charolette and your family. Continued prayer for your amazing strength and the little joys God is bringing into her life. Praying for Charlotte’s miracle. Asking God to keep you strong. BTW sweet Charlotte looks so beautiful, precious child!! Much love to all your family. I’m friends with Kim and have followed her story a long time. I am praying for all of you and tell her she is sooooo Brave!! My little girl prays for her and even named a doll after Charlotte! Lord Bless you all!! !